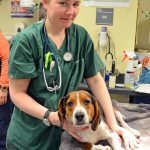 The Tufts Shelter Medicine Program at Cummings School is committed to raising awareness about the needs of shelter animals and the sheltering community among all veterinarians. 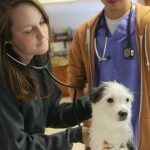 Therefore part of our program includes elements of the core DVM curriculum and M.S. 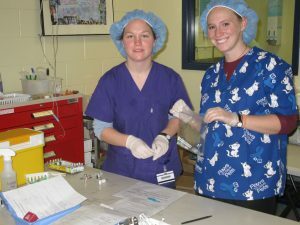 in Animals and Public Policy (MAPP) curriculum, which are required for all students. 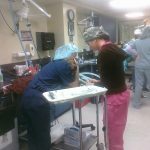 In addition, there is a selection of experiential and didactic courses that pre-clinical students can take during Selectives time in the Shelter Medicine Program and elective Clinical Rotations in medicine and surgery are available during the clinical year. 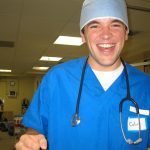 Experiential learning and rotations take place both on campus as well as the Cummings School campus, utilizing a network of partnering organizations. 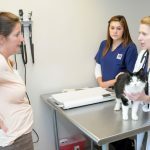 During the companion animal module of the Animals and Society class, students examine issues surrounding pet ownership, responsibilities towards homeless animals, the way that humans have manipulated animals through selective breeding and the use of animals in sports and hobbies. 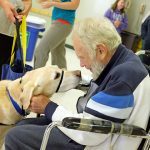 This course includes an in-depth look at the history of pet overpopulation, how animal shelter policy today is affected and policy considerations that address causes and solutions to pet overpopulation. 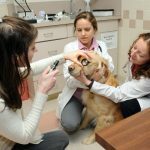 An Association of Shelter Veterinarians (ASV) task force defined the key areas of study for shelter medicine. 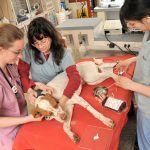 These topics are essential to the work of the shelter veterinarian and are similar to the framework of content included for Board Certification in Shelter Medicine which is through the American Board of Veterinary Practitioners (ABVP).